Right now, researchers are on the cusp of life-saving discoveries and many more cancer patients need the transformative care we offer. Your help is urgently needed. Guy's Urban Challenge is back, bigger and better than ever before! The ballot results are out and we want you on our team! Don't worry if you've been unsuccessful, you can still apply for one of our charity places. Sign up to Bake it Big and hold your greatest bake sale yet! Because we want to provide even better support for our patients, visitors and staff. Because donations help fund life-saving equipment, life-changing research and better facilities – over and above what the NHS can provide. Because we have built a world-class Cancer Centre where we will continue to improve treatment and find cures for people with cancer. Help our cancer patients to receive the finest care possible. We need your support today. Find out more about how to remember Guy's and St Thomas' in your will. 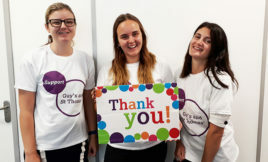 Keep up-to-date with news from Guy's, St Thomas' and Evelina London, ways to support us, and events you can sign up to in order to help fundraise for our hospitals. Guy's Urban Challenge is back, bigger and better than ever before! Register to take part in London's ultimate urban triathlon.